September 9, 2018 – As the summer begins to wind down, with the weather also beginning to turn cool, the 2018 edition of the Coho Run took place on a dreary Sunday morning. The morning was telling all of the competitors that autumn had undeniably begun, but the rain was just a new obstacle where there had previously been scorching heat. 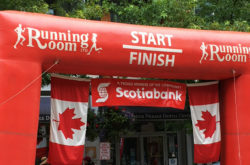 With this in mind, we conquered the 14 km course, as it led from the start line at Kits Beach, through Stanley Park and over the Lion’s Gate Bridge, terminating at Ambleside Park. This was one of the season’s more difficult runs, for many reasons, including weather, distance, and the fact that we are nearing the end of another summer of competing. While there was the inherent feeling of accomplishment as we headed down the backside of the Lion’s Gate and into Ambleside Park, there was a deep chill over everything, despite all the blood pumping pumping. The beautiful setting for this event would have made it understandable if you had wanted to just stop and stare for a moment. What stood out most was the flowing variation between stages of the run. A completely clear blue sky set the stage, with an already hot sun evaporating dew from the Ceperley Park lawn. Down along the shoreline to English Bay, fresh ocean air enveloped everything. This shifted to the awakening West End along Beach Avenue, and then through to the peace of the Lost Lagoon. Rounding out of Stanley Park, the energy of the morning Seawall activity in Coal Harbour provided a boost to go all-out for the last kilometre, welcomed by a crowd of onlookers. 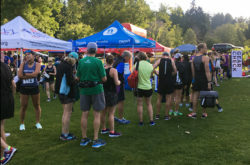 Despite all that has been said about the difficult conditions during the Coho Run, one of the highlights of it every year is the concurrent Coho Festival taking place in Ambleside Park, directly following the race. Focused on the protection and conservation of Canadian salmon, the Coho Festival offered up delicious food, including the annual sustainably sourced salmon feast, live entertainment, and a market of local vendors and organizations. This was the perfect punctuation on a lively morning. Through both the organization of the run and festival, the Coho team were always extremely helped, organized, and enthusiastic. Signs clearly and vibrantly marked the race course, and there were always volunteers present to answer questions or provide assistance. Combining these two events so seamlessly provided an enjoyable and satisfying experience for all the runners.